Savory Spice Club and Spanish Pinchitos | We Like to Cook! A pincho is a traditional tapa eaten in bars in Northern Spain. Pinchos are especially popular in the Basque region where they have a strong socializing component, and are usually regarded as a cornerstone of the local culture. While the pinchos are related to Spanish tapas, the primary difference is that pinchos are served on a skewer or toothpick. In fact, the word pincho literally means "thorn" or "spike." In many bars, these snacks are served on self-serve platters and placed on the bar. Patrons keep the toothpicks to tally their bills at the end of the evening. So imagine my surprise when I received my first month’s delivery from Savory Spice Shop’s new Spice Club and found a packet of Southern Spain Pinchito Spice and a packet of Aleppo pepper along with a recipe card with detailed instructions and gorgeous photos of the completed dish. The Pinchito Spice blend adds a Spanish-influenced curry flavor to whatever you're using it in. It works both as a marinade for the meat and as a dipping sauce for the grilled kebabs. The Savory Spice Club delivers a spice-of-the-month to your mailbox with new flavors & unique recipes that will inspire you to think about seasonings in a new light. Choose from three options depending on how many spices and recipes you want to receive for the year. The monthly kits are perfect for any level of home cook or spice lover and are enough to make a meal that will generously feed four people. For sauce: Whisk together all sauce ingredients and refrigerate until ready to serve pinchitos. For pinchitos: Soak some bamboo skewers in water for 30 minutes or longer. Then in a gallon-size zip top bag or other sealable container, thoroughly combine Pinchito Spice, vinegar, and oil. Add meat and toss to coat all pieces with marinade. Refrigerate for 1 to 4 hours. Preheat grill to medium-high. Thread skewers with alternating meat and veggie pieces. Grill 5 to 7 min. per side, or to desired doneness. 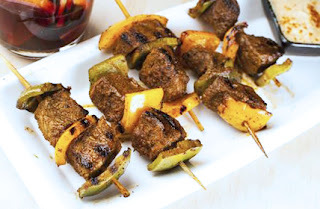 Transfer skewers to a platter and sprinkle with crushed Aleppo chilies to taste. As a meal, serve over a bed of rice and drizzle with sauce. As an appetizer, serve on smaller skewers with sauce on the side for dipping. For a vegetarian option: Use 14 oz. extra firm tofu or 1 lb. eggplant in place of meat. For eggplant, sprinkle cubes generously with salt and let sit in a colander for 30 min. to remove excess moisture before marinating. And, for a vegan option: simply use a non-dairy yogurt for the sauce. While we received complimentary spice packets from Savory Spice Shop, we received no additional remuneration. The opinions included herein are honest and unsolicited.